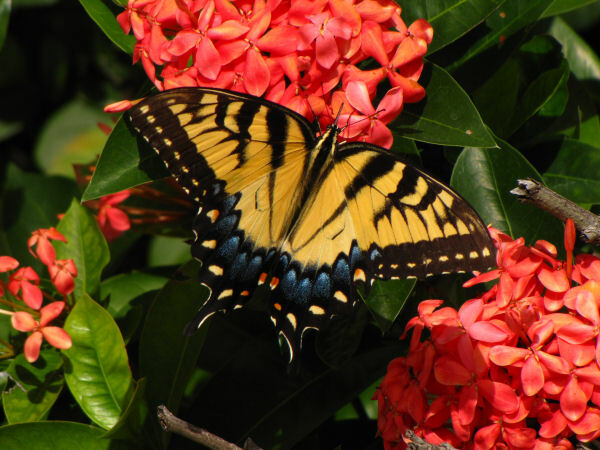 North Carolina hosts about one hundred and seventy five butterfly species, including the Eastern Tiger Swallowtail, the official state butterfly. Many people might not know that trees are the key to inviting Eastern Tiger Swallowtails to a North Carolina back yard. North Carolina extension suggests White Ash, Yellow Poplar and Carolina Willow as host plants for the species. 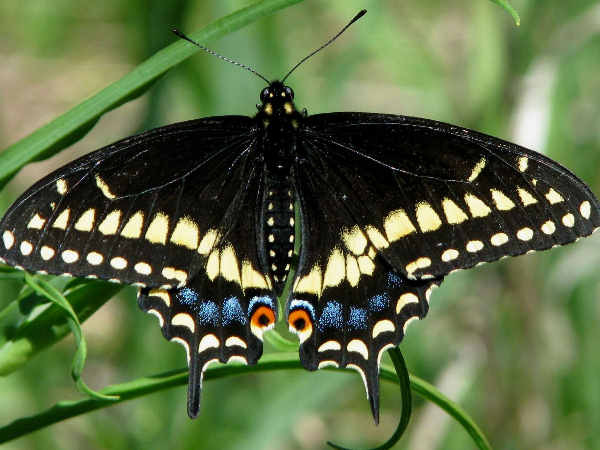 The Black Swallowtail identification using the top of the wings starts by noting that males have two lines of yellow dots. Blue dots between the yellow dots may be absent. Females show a less definite inner line of yellow with separate spot near tip of wing. They are very common across North Carolina because the larval host plant is the very common parsley. The Appalachian Tiger Swallowtail and Palamades Swallowtail have the least distribution in the state. Otherwise, North Carolina butterflies means swallowtails. Most of the species have a state wide distribution. Spicebush attracts Spicebush Swallowtails and Palamedes Swallowtail. Pawpaw attracts the Zebra Swallowtail. See your local garden club or nursery for native plants suited for your particular garden. Butterfly identification usually begins with color. The list of North Carolina butterflies presented here is divided into families with color as a key family trail. The one page introduction is not sufficient to provide all the butterfly pictures. Please press the green butterflies button for additional pictures and information. 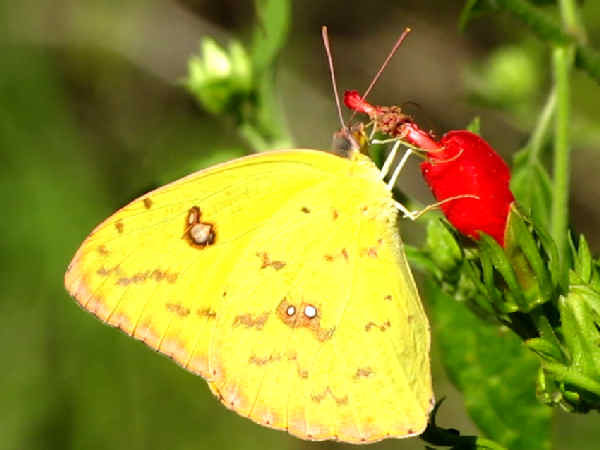 Most North Carolina butterfly enthusiasts spend a lifetime trying to differentiate between the Clouded Sulphur, Orange Sulphur and Cloudless Sulphur. First, the only real difference between the Clouded and Orange Sulphur is the presence of more orange on the top of the wing for Orange Sulphurs. In instances where a butterfly is old and has lost wing color that can be difficult. The Cloudless Sulphur pictured has a more busy pattern on the side wing. Here’s a list of the rest of the white butterflies and yellow butterflies documented in the state. In the white butterflies category, the Falcate White and Cabbage White are the only two common species throughout the state. No differentiation of the Gossamer Wing butterflies is perfect. The Eastern-tailed blue, pictured, for example, has a hair like appendage at the bottom of the wing similar to hairstreaks. North Carolina’s Coral Hairstreak does not have that hair like appendage. Keeping those caveats in mind, the state does support a nice and diverse population of blues, coppers and hairstreaks that are listed below. Most of the Hairstreaks have only a limited distribution. The Gray, Red-banded and White-M are probably the most widely distributed species in the state. Eastern-tailed Blues and Summer Azures are the most common of the North Carolina blue butterflies. Like many Southern states, North Carolina has a very diverse Brush Footed butterfly population. Many of the species easily take to back yard butterfly gardens. 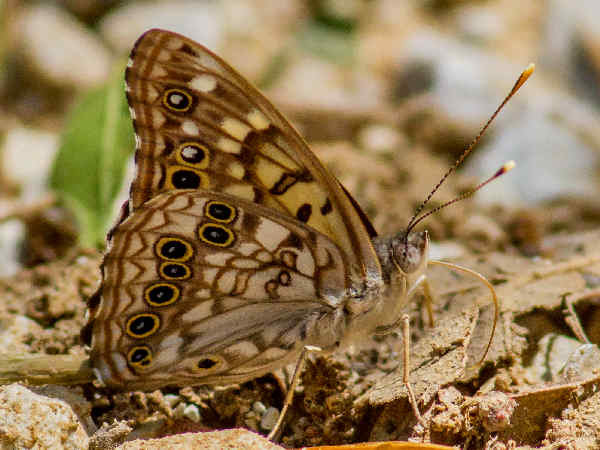 Hackberry Emperors, for example, can be found wherever the caterpillar host plant, Hackberry, grows. The Little Metalmark is the state’s only metalmark species.